Ahh, a pun. I must now whack you with this trout. Good shot, suits the sepia toning well. I'm curious where you found this stuff. 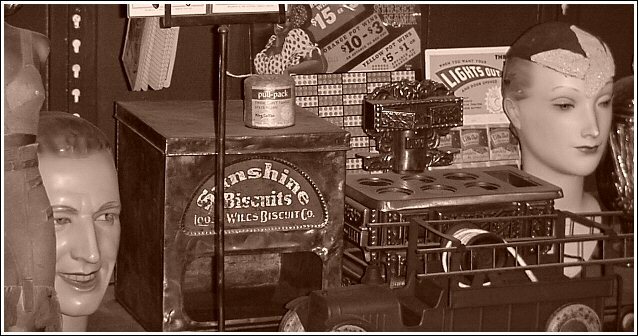 It looks like a general store in the 50s (goes along with that tone). The sepia toning seems a little odd to me the more I look at it. A little more cool than I tend to envision sepia being, maybe. The shot is so busy that the eye doesn't really have anywhere to go. The focus and lighting are nice, but the image itself is a bit of a jumble. Interesting shot with lots of neat things going on. The tone seems to be missing a true black, though. And this causes the shot to lose a lot of snap. Proudly hosted by Sargasso Networks. Current Server Time: 04/20/2019 02:27:12 AM EDT.